In this spot on the weekend, I am usually reviewing past stock picks for their eventual performance. However, the week of June 5, 2006, was devoid of any new selections. So not one to pass by an excellent opportunity, I shall be skipping the review this weekend and shall wait for next weekend for an examination of some more past stock selections. I sold these shares because the market was up strongly today in spite of what I feel may be fundamental problems addressing the economy. We have not really resolved the subprime mortgage problems, we have not figured out to help stop the plunging dollar, and we still have problems with budget deficits, trade deficits, and ongoing war in the Middle East. I know that market climb 'walls of worry', but I am worrying plenty. Since this is just a 'trade' outside of my core trading portfolio, I wanted to sell out these shares as my margin balance is still considerable and it is wise to sell when others are buying....at least for this particular position. Anyhow, that's the news. I shall still reserve the opportunity to be doing a 'trade' within the context of investing. I hope that this dual approach to investing shall be profitable. Wish me luck! Chipotle Mexican Grill (CMG) "A Reader Suggests a Stock Pick"
Definitely my favorite part of blogging is to read comments and receive questions and suggestions from readers. Some of you become my online friends and some of you are friends and family in real life. I received a letter from Aaron B., who was home from work over Thanksgiving and my family joined his family for turkey and fixings which is a tradition for our families during this holiday. As background, Aaron is probably one of the brightest young investors I know and is developing an interest in investing. I’ve been looking through the different tools you showed me, and found a stock I like for my next buy. Have you ever looked at Chipotle (CMG)? I couldn’t find anything on your site about it, but you said the search usually doesn’t work. It seems to meet all of your criteria, what do you think? Thanks so much for writing. I have not written up Chipotle (CMG) but I would be happy to briefly take a look at this company/stock and see if it indeed fits into my 'scheme' for investing. 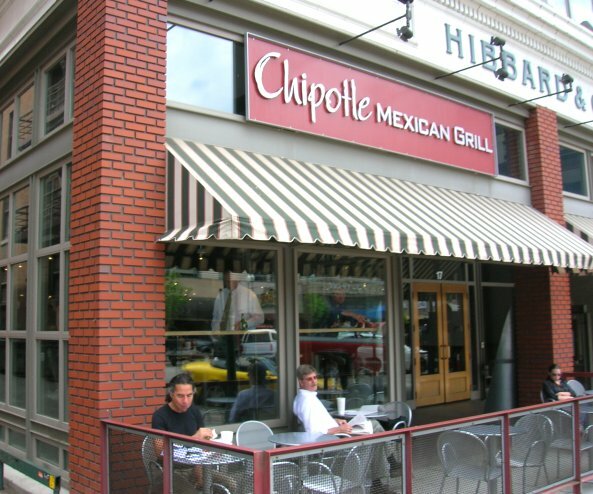 First of all Chipotle closed today (12/5/07) at $138.79, up $1.28 or .93% on the day today. This was not enough to make the top % gainers by any means. And as you probably know (or not) I generally start with those stocks on that list for inclusion on the blog. I am looking for stocks with lots of price momentum! I am also not bothered by the $138 price level. Some investors want to buy stocks that are just at the pennies/share level so that they can buy thousands of shares. I would rather see you purchase just a few shares of a stock that is high quality (as I define it) rather than thousands of shares of a low-quality 'penny stock'. "...engages in the development and operation of fast-casual, Mexican food restaurants in the United States. As of December 31, 2006, it operated 581 restaurants, including 8 franchise restaurants. Chipotle Mexican Grill, Inc. was formerly a subsidiary of McDonald's Corp."
Another thing I like to investigate when reviewing a company is the latest quarterly report. I am looking for a company growing its revenue and earnings and possibly beating expectations as well as raising guidance. How did Chipotle do in the latest quarter? On October 30, 2007 Chipotle reported 3rd quarter 2007 results. For the quarter ended September 30, 2007, revenue increased 35.6% to $286.4 million. Perhaps even more important than that impressive growth figure, the same store sales increased 12.4%. Whenever we have a retail venture, whether it is selling purses or burritos, reporting sales, it is absolutely imperative to ask about same store sales. This figure represents the change experience in sales by comparable stores year-over-year. This is a better representation of the health of a company compared to the gross sales figure because it gives us an idea of how individual stores are performing. Net income for the quarter came in at $20.6 million or $.62/diluted share, up sharply from the $11.8 million or $.36/diluted share during the same period in 2006. These were great results! But sometimes just as important as the results on subsequent price performance is what the expectations were. And Chipotle delivered the 'burrito' in this department as well. In fact, they beat expectations according to analysts polled by Thomson Financial which had been expecting profits of $.53/share on revenue of $279.3 million. Aaron, as we discussed Thanksgiving, I like to find stocks that not only have had a great quarter but that show persistence of earnings growth. As we discussed, I am always looking for a certain 'profile' of a company to choose to invest in. It isn't really about the product, whether it be fast Mexican casual like Chipotle (I do like their restaurants! ), but rather the financial results that result from their business. That's probably where I differ from the Peter Lynch approach. In any case, what I want to find when researching a company is a record of steady revenue growth, steady earnings growth, stable outstanding shares, possibly a dividend and if so possibly a steadily increasing dividend, positive free cash flow that is also hopefully showing a record of steady growth, and a solid balance sheet which for me means lots of cash and current assets and much less current liabilities. For this information, I have found the Morningstar.com "5-Yr Restated" financials most helpful. Be sure and familiarize yourself with this page. I believe it is one of the most important keys to my investment decisions! Starting with revenue growth, I am sure you noted the steady growth in CMG from $205 million in revenue in 2002 to $823 million in 2006 and $1.02 billion in the trailing twelve months (TTM). Revenue growth is solid! Earnings were initially losses starting with $(.87)/share in 2002, $(.34)/share in 2003, then turning profitable at $.24/share in 2004, $1.43/share in 2005, a dip to $1.28 in 2006, then back up to $1.93/share in the TTM. Earnings look great! The company does not pay any dividends. Outstanding shares have increased modestly from 20 million in 2002 to 32 million in 2006 and 33 million in the TTM. This 13 million increase in the shares, amounting to a 65% increase was coupled by revenue which was up about 400%, and earnings, which were up even more than that. This share dilution is certainly acceptable relative to the other financial results. Looking at the 'free cash flow' we can see an acceptable but not terribly exciting picture. CMG had a negative $(56) million in free cash flow in 2004, improved to a negative $(6) million in 2005, then positive $6 million in 2006 and $3 million in the TTM. You can see that the free cash flow is being consumed by the large increase in capital spending. However, the company is free cash flow positive. During the big tech bubble in 2001, many high tech stocks had lots of cash from public offerings but never generated any money and instead consumed their available cash. This 'negative free cash flow' was called their burn rate. From my perspective, part of calling a stock 'healthy' and 'investable' requires it to be generating and not consuming its cash. Finally, let's examine the balance sheet as provided by Morningstar. We can see that the company has $168 million in cash which by itself is more than adequate to cover both the $70.3 million in current liabilities and the $76.3 million in long-term liabilities combined. There aren't a lot of stocks out there that have that level of cash. I am not really a value investor. But I do believe that valuation is something that all of us should be aware of. When we discover a great stock, valuation may be the key that let's us know whether we are 'early' or 'late' to arrive to the party :). I like to utilize the Yahoo "Key Statistics" for this purpose. In Chipotle's case, the market cap is at the mid cap size at $4.57 billion. The trailing p/e is rich at 51.21. But more to determine how reasonable that p/e is in terms of growth expected, the PEG also comes in rich at 2.36 (5 yr expected). I prefer, if possible, to find stocks with PEG's between 1.0 and 1.5 or lower. A couple of years ago I read a great article by Paul Sturm on SmartMoney.com explaining how a Price/Sales ratio may also help get a feel for valuation of a stock. I recommend this article to you highly. It is the company's Price/Sales ratio compared to similar companies that helps us assess whether this ratio is high or not. According to the Fidelity.com eresearch website, Chipotle has a Price/Sales (TTM) ratio of 4.42, just under the industry average of 4.44. Thus valuation is reasonable from this perspective. In terms of profitability, at least as measured by the "Return on Equity", Chipotle is a bit light on this ratio with a value of 12.73% compared to the industry average of 15.80%. Some other things I can glean off of Yahoo include outstanding shares which for this company is 32.91 million with a float of 31.42 million. Currently there are a good number of shares out short totaling 5.77 million as of 11/9/07, representing 40.60% of the float or 6.8 trading days of volume (the short ratio). I have arbitrarily set '3 days' as the limit of acceptable short interest. From my perspective, a ratio above 3, especially above 6 means there are a lot of investors who have sold lots of borrowed shares expecting a decline in the stock. If instead, we continue to have good results from CMG, we could be observing a short 'squeeze' . However, if these shorts 'know something we don't', well then we may well have an unraveling in process. However, I believe these short-sellers are simply betting against the 'valuation' of this stock with the high p/e and high PEG ratios. Just my hunch though. Generally a large short interest is bullish in my view. Finally, we can see that no dividend is paid and no stock splits are reported in this relatively recent publicly offered stock. Influenced by your dad's and my stock club, I have really grown to appreciate 'point and figure' charting. 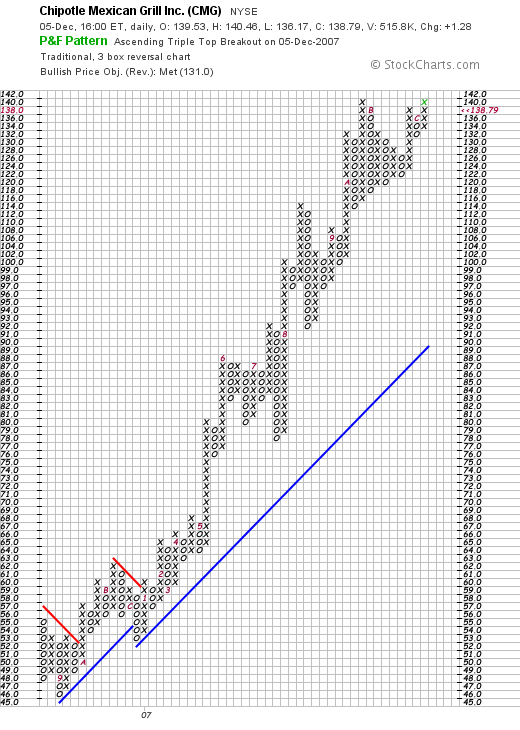 Examining the 'point and figure' chart on Chipotle (CMG) from StockCharts.com, we see an incredible picture of price appreciation strength. Now as you know, except as an occasional trade, my purchases are limited to my own stocks giving me a 'signal' to buy. If I did have a 'signal' this is indeed the kind of stock I would be buying. I hope this answered your question! If you have any other questions, or if any of you readers have comments or questions, please feel free to leave them on the blog or email me at bobsadviceforstocks@lycos.com. If you get a chance, be sure and visit my Podcast Website, where you can listen to me discussing many of the same stocks I write about here on the blog. Also, be sure and visit my Covestor Page where you can view how my real Trading Portfolio is performing and how it is doing relative to the indices and other investors! Also, be sure and visit my SocialPicks page where all of my stock picks are monitored over the past year. Thanks so much for writing and visiting! All of you readers and visitors make blogging worthwhile for me. I am sure I am learning more as I write up all of these stocks and answer questions. I hope that all of you find it helpful as well! Have a great Thursday trading! Hello Friends! A quick update on my Commscope (CTV) purchase. The stock really seemed to be out of steam today and with this oversized purchase sitting in my portfolio, I decided to sell 1/2 of the position, 300 shares, which I sold at $45.86. This was a loss of $(.51)/share or (1.1)% since purchase. Quick confession. I didn't look at the chart before making this trade. Last time I do THAT. The stock price appears to have broken down in October at about the $51 level. A good move higher above that level would be required to establish a reliable challenge to this change in price momentum. Anyhow, that's my amateur assessment of the situation. I have left 1/2 of my 600 shares of CTV. And unless the stock breaks down further, will try to ride this portion higher as I did with my Bolt (BTJ) shares. I am still learning and hope you are learning with me as well. If you have any comments or questions, please leave them on the blog or email me at bobsadviceforstocks@lycos.com. Commscope (CTV) and Bolt (BTJ) "Trading Transparency"
As part of my 'adventure' blogging here I am trying to learn how to execute what I would call 'trades', that is, relatively large positions purchased for short period of time. This is in addition to my regular disciplined investment management strategy for the bulk of my holdings. My last purchase of Bolt (BTJ) has been of mixed success after a resounding success with Graham (GHM). I sold 400 shares of my 800 share position of Bolt at a small loss; I held on to the rest of the shares until today when I decided to go ahead and sell the remaining shares. My 400 shares of Bolt (BTJ) were sold a few moments ago at an approximate price of $39.92. These shares were acquired 11/27/07, just a few days ago, at a price of $37.34. Thus I had a gain of $2.56/share or 6.9% on these shares. I have discussed this purchase earlier. I do think the market is recognizing the value of Bolt (BTJ) and the stock is still rated a BUY. However, after looking at the list of top % gainers on the NYSE today, I saw a stock moving strongly higher in a strong market, that I have reviewed previously: Commscope (CTV). CTV is trading at $46.60, up $6.41 or 15.95% on the day. Trying to ride the momentum on a stock that has strong fundamentals and reasonable valuation, I purchased 600 shares at $46.37. I recently wrote up Commscope on May 31, 2007, on Stock Picks Bob's Advice so I am familiar with the stock. Wish me luck! I am modifying my rigid portfolio management system to give me the flexibility of doing a 'trade' in my account. For the rest of my holdings I shall be keeping to my portfolio management system. Time will tell if these moves are reasonable and wise in the context of a portfolio investment discipline. It is late and I wanted to get this write-up on the blog. Let me see if I can do this briefly. 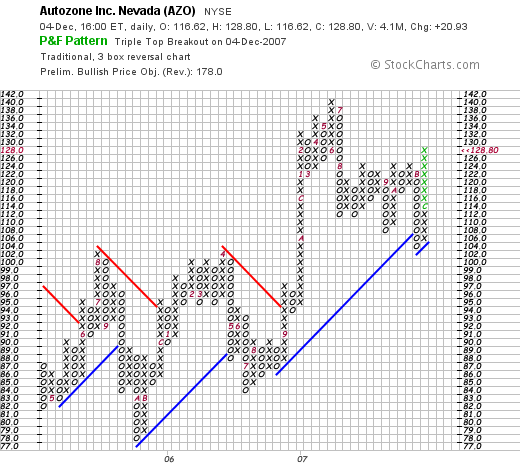 This morning before the opening of trading, AZO announced 1st quarter 2008 results. Net sales climbed 4.5% to $1.5 billion with same store sales up 1.3% for the quarter. Net income was up 7% from the prior year, while earnings per share climbed 17.4% to $2.02 from $1.73/share last year. What drove the stock higher, among other factors, was the earnings report which beat expectations of $1.93/share. Longer-term, reviewing the Morningstar.com '5-Yr Restated' financials on AZO, we can see that while 'slow and steady' may describe these results, the company has been cranking out steady revenue growth, earnings growth with strong free cash flow growth and a solid balance sheet while maintaining and decreasing the number of shares outstanding. Checking some "key statistics" we can see that this is a large cap stock with a cap of $8.36 billion. The trailing p/e is rather cheap at 15.10 with a forward p/e (fye 25-Aug-09) of only 12.24. Thus the PEG (5 yr expected) is reasonable at 0.96. There is moderate short interest on this stock with a short ratio of only 3 (2.27 million shares out short as of 9/11/07). The last stock split was April 21, 1994, when the stock split 2:1. Looking at the 'point & figure' chart from StockCharts.com, we can see that the stock has traded in what I would describe a volatile fashion with a definite upward bias. After dipping as low as $78 in October, 2005, the stock has gradually traded higher to its recent high of $140 in June, 2007. The stock dipped to as low as $104 in November, 2007, before the recent spike back to the $128 level. The chart looks encouraging but not over-extended. To summarize, this company which sells auto parts and accessories made a big move higher today on a surprisingly strong earnings report. They are continuing a longer-term success with steadily growing revenue, earnings, free cash flow, and a solid balance sheet while maintaining and actually decreasing the outstanding shares. Valuation is reasonable and the chart looks encouraging. It is the kind of stock I would be buying if I were. Now off to my stock club tonight! As one of the roles of this blog, I have been sharing with you my thoughts on a multitude of 'investable' stocks. In addition, I am also trying to provide transparency on my actual investment activities. Recently, I have been participating in Covestor, where you can visit my Covestor page and review my actual holdings, purchases, sales, and performance overall relative to the S&P and other investors. I would encourage you to visit there. But I plan on continuing to examine my holdings one by one on intervals. Currently I own 14 positions in my trading account. Trying to review a holding every 3 or 4 weeks, I shall be reviewing each holding about once/year. When I make a trade in any holding I shall certainly review that trade and the rationale behind it. When indicated, I shall also revisit each stock I hold, but my purpose of this blog is not to pump stocks but rather to share with you the reader my honest assessments of stocks from the perspective of an amateur investor. I share with you my accomplishments and my mistakes. From these discussions, I have tried to continue to enhance my own ability to build and manage a portfolio of stocks. I hope that this effort is helpful for you as well. Last month I reviewed U.S. Global Invesors (GROW) a stock that I had at that time in my portfolio. I no longer own GROW, having sold those shares on November 7, 2007 with a small loss. Going alphabetically (by symbol) through my holdings brings me to Harris Corp. (HRS). Let's take another look at HRS and see if it still deserves a spot in my blog and in my portfolio! What is my current holding and my trading history? When would I sell next? Having sold a portion of my holding at the 30% appreciation level, on the upside my next targeted appreciation level would be at a 60% appreciation point. This would work out to 1.6 x $50.05 = $80.08. On the downside, after a single sale at a 30% level, I move up my 'mental' stop to break-even (instead of an (8)% loss. Thus, if the stock should decline back to my purchase point--$50.05, then that decline would trigger a sale of the entire position. 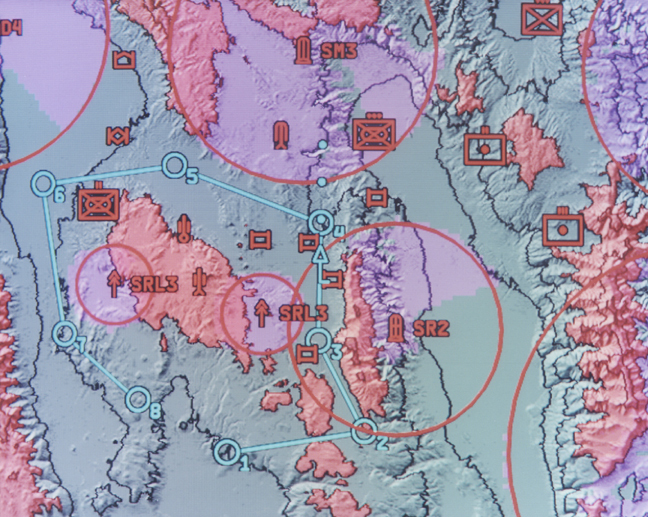 "...together with its subsidiaries, operates as a communications and information technology company that serves government and commercial markets worldwide." How did the do in the latest quarter? On November 1, 2008, Harris reported 1st quarter 2008 results. For the quarter ended September 28, 2007, revenue increased 30% to $1.2 billion from $947 million in the same quarter last year. Net income was $100 million or $.73/diluted share, up from $83.9 million or $.60/diluted share in the same period a year ago. With this report the company also beat expectations. According to Thomson Financial analysts, Harris was expected to come in at $.74/share (excluding items the company came in at $.76) on revenue of $1.18 billion. The company also raised guidance for fiscal 2008 to a profit range of $3.35 to $3.45/share from prior guidance of $3.30 to $3.40/share. The company also announced that 2008 revenue should come in 21% ahead of the 2007 level. From my perspective, a company that can report great results, beat expectations and raise guidance all at once, is about as strong an earnings report as an investor couple possibly hope for. Reviewing the Morningstar.com "5-Yr Restated" financials page, we can see the steady revenue growth fronm $2 billion in 2003 to $4.5 billion in the trailing twelve monts (TTM), the steady growth in earnings from $.45/share in 2003 to $3.43/share in 2007 and $3.56/share in the TTM, the increasing dividend from $.20/share in 2003 to $.50/share in the TTM, the expanding free cash flow from $204 million in 2004 to $359 million in the TTM, and the reasonable balance sheet with approximately $1.87 billion in current assets compared to $1.41 billion in current liabilities. On the 'downside' there is the matter of the increased float from 14 million shares in 2003 to 23 million in 2007 and 140 million in the TTM. This, as I understand it, is due to issuance of shares for acquisitions. In any case, this increase in shares hasn't stopped the company from steadily increasing per share amounts. Checking Yahoo "Key Statistics" on Harris (HRS), we find that the market cap for this stock is $8.60 billion, making this stock a large cap stock. The trailing p/e is a reasonable 17.59, with a forward p/e (fye 29-Jun-09) of 16.01. With the strong growth expected (5 yr estimated) the PEG works out to a satisfactory 1.23. Using the Fidelity.com eresearch page, HRS is shown to be reasonably valued with a Price/Sales (TTM) of 1.84, compared to the industry average of 5.14. In terms of profitability, as measurd by the Return on Equity (TTM), HRS comes in a bit under the industry average at 25.34% with the average being 26.87%. Finishing up with Yahoo, we discover that there are 137.05 million shares outstanding with 135.89 million that float. Currently, as of 11/9/07, there were only 955,740 shares out short representing only 0.9 trading days of volume (the short interest). This doesn't appear significant to me. The company currently pays a dividend of $.60/share yielding 1%. The last stock split was a 2:1 split paid out on March 31, 2005. 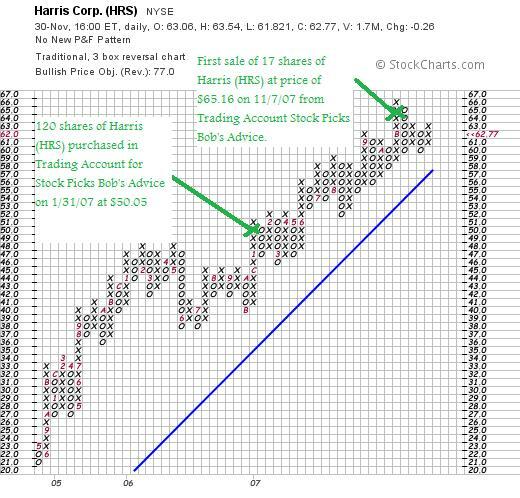 Looking at the "point & figure" chart on Harris from StockCharts.com, we can see the steady appreciation in this stock from May, 2004, when the stock was trading as low as $21 to its peak in November, 2007, when the stock hit $66/share. The stock chart looks strong overall and hasn't broken down its strong and steady price appreciation. Let's review some of the findings I discussed above. First of all the stock has been moving steadily higher trading a bit under its all-time high of $66. The stock reported quarterly results that were strong, beating expectations, and went ahead and raised guidance. The Morningstar.com report is also solid. My only concern is the apparent rapid growth in shares recently. But that does not appear to be significant as earnings and revenue growth have maintained a solid record. Valuation-wise, the p/e isn't bad, the PEG is under 1.5, and the Price/Sales is competitive. The Return on Equity is a tad under the average. And the chart looks solid. The stock looks great. I have a small amount of concern with all of these defense contractors as we head into an election that might result in some changes for their prospects. But even this is only a small concern for me. I like this stock a lot. In fact I own the stock! Thanks again for visiting! Be sure and visit my Covestor Page where you can find out more about my Trading Account and other investors who have chosen to participate on this website. (If you are interested in participating on Covestor, drop me a line at bobsadviceforstocks@lycos.com or just leave a message on the blog, and I shall send you a password for an account. I have four of those passes left and would like to share them with all of you readers!). If you find the time, be sure and visit my Podcast Website where I discuss many of the same stocks I write about here on the blog. In addition, consider taking the time to visit my SocialPicks page where all of my picks from 2007 (even those I do not own) are evaluated and reviewed. If you have any comments or questions, please feel free to leave them on the blog or email me at bobsadviceforstocks@lycos.com. Wishing you all a healthy and profitable week in the market. Usually in this location I would be posting about the various stock picks from the week a year and a half earlier. But I shall skip this review this week as there were no picks during that particular week. I can hear you saying that why don't I go ahead and review the next week then. Well it did cross my mind, but I have lots of things 'on my plate' this weekend and I shall take advantage of this fact to wait till next weekend to move ahead. Until then, be well and have a great week trading! If you get a chance, be sure and visit my Covestor Page where all of my trades from my trading account are reviewed, my SocialPicks page where my picks from the past year are reviewed, and my Stock Picks Podcast page where you might listen to me reading a poem or possibly reviewing one of the many stocks reviewed on this website. If you are adventurous, willing to take on a different kind of risk, and enjoy the possibility of greater returns on your money than possible in a money market account, you might wish to explore Prosper.com where you can participate in person-to-person loans in the form of a small portion of a larger group of lenders lending money with the Prosper.com website as an intermediary. But be forewarned, this kind of activity, while potentially with oversized returns, is fraught with risk involved in unsecured lending where only the risk of a credit-report 'ding' and being turned over to a collection agency stands between many of the lenders and defaults which can greatly reduce your returns. I shall try to write up a report on my Prosper.com experience as this develops. NVE Corporation (NVEC) "Revisiting a Stock Pick"
I wanted to see if I could briefly write up NVEC once again on this blog. NVE Corporation (NVEC) made the list of top % gainers on the NASDAQ today, currently trading at $27.70, up $3.10 or 12.60% on the day. I do not own any shares nor do I have any options on NVEC. I call this a "revisit" because I first posted NVEC on Stock Picks Bob's Advice on June 23, 2004, when the stock was trading at $36.61. Thus the stock is trading under that level! I next revisited this stock on the blog on September 5, 2006, when the stock was trading at $34.01, also higher than the current stock price (!). And yet even with two prior picks at higher levels, I am back looking at this stock once more! It certainly hasn't gotten away without me yet. Last month, on October 17, 2007, the company reported 2nd quarter 2008 results. Total revenue climbed 14% to $5 million from $4.4 million the prior year. Net income increased 28% to $1.64 million or $.34/diluted share, from $1.28 million or $.27/diluted share the prior year. The Morningstar.com "5-Yr Restated" financials page looks solid. The company has been steadily increasing its revenue since 2003 (except for a slight dip in 2005 to $11.6 million from $12.0 million), and has also (except for a dip in 2005) been increasing its earnings from $.15/share in 2003 to $1.00/share in 2007 and $1.22/share in the trailing twelve months (TTM). Outstanding shares have been fairly stable with 4 million in 2003, 5 million in 2004 and 5 million in the trailing twelve months. Free cash flow has been positive and growing with $-0- reported in 2005, $3 million in 2006, $5 million in 2007 and $6 million in the TTM. The balance sheet appear solid with $1 million in cash and $7 million in other current assets with $.9 million in current liabilities and $-0- in long-term liabilities. Per Yahoo Key Statistics, this is a tiny company with a market capitalization of only $127.23 million. The trailing p/e is 22.44, the forward p/e is 17.94 (fye 31-Mar-09) and the PEG (5 yr estimated) is only 0.79. According to the Fidelity.com eresearch website, the company is relatively richly priced with a Price/Sales (TTM) of 6.28 compared to the industry average of 3.98. Return on equity, however, is more profitable than the industry average coming in at 23.66% compared to the average of 14.38%. Per Yahoo, there are 4.64 million shares outstanding with 4.62 million that float. As of 10/26/07, there were 1.32 million (!) of those shares out short representing 28.60% of the float or 14.2 trading days of volume (well above my own '3 day rule' for short interest). No stock dividends and no splits are reported. 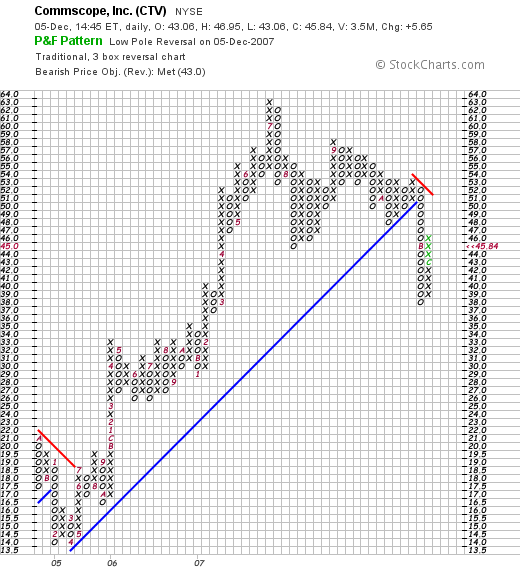 Looking at the 'point & figure' chart from StockCharts.com, we can see that this stock has been highly volatile, bottoming in May, 2005, at $11.50 and has subsequently broken through resistance and appears to be moving higher. It is a very volatile stock. I still like this stock. I have yet to have any of these picks move higher for me :(. Each time I have picked the stock it has moved lower until I once again revisit it here. I am optimistic that since the financial results bottomed in 2005, the stock is once again moving higher. Time will tell. NVEC reported terrific earnings, has reasonable valuation, a PEG under 1.0, solid Morningstar.com results, a nice balance sheet, and a very volatile and less-convincing price chart. Thanks so much for stopping by and visiting my blog. If you have any comments or questions, please feel free to leave them on the website or email me at bobsadviceforstocks@lycos.com. Covestor.com "Home of Great Investors"
Hello Friends! Thanks so much for stopping by and visiting my blog, Stock Picks Bob's Advice! As always, please remember that I am an amateur investor, so please remember to consult with your investment advisers prior to making any investment decisions based on information on this website. I finish many of my blog entries with an invitation for all of you to visit my Covestor Page, and I still extend to all of you that same invitation. But in this article, I would like to invite you to visit some of the other great participants on Covestor, many with performances exceeding my own. Sean Hannon, who blogs on Covestor as epicadv has a phenomenal record on Covestor with an annualized rate of 211.26%! (My own rate is around 21%, not bad but nothing like Sean's). Sean works as an investment advisor at EPIC Advisors, LLC. Kudos to Sean! Flatwallet (that is the name he goes by) has done a terrific job in his account. He is up 30.81% since inception of his trading account association with Covestor, and has an annualized return of 103.47%. Flatwallet blogs over at "Get Rich or Blowout Tryin!". Another blogger and a terrific investor is mooney who blogs over at The Gnome of Zurich Investor. Mooney is up 25.10% since his participation with Covestor and has an annualized return of 60.39%. My point is that you really ought to drop by and visit Covestor! It is not just about me, it is about lots of great people like the bloggers and investors I have discussed above. You can find about what they are buying, and what they are selling. And read their rationales. I sure enjoy my affiliation with Covestor. p.s. If you are interested in setting up your own account for Covestor, be prepared to allow them to access your actual holdings and be prepared to be analyzed and followed by others. It is great when you are doing well; and can be a challenge when you might be underperforming the market! But I sure enjoy seeing all of the great and enthusiastic people who have signed up on this website strut their stuff!